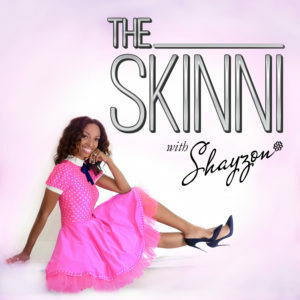 In this episode of “The SKINNI,” Style and Beauty Expert, Host, and TV personality Shayzon talks about being happy in the skin you’re in. Whether you face backlash because of your natural hair, your skin color, or your age, it does not define you. Awesome show! This is something that NEEDS to be discussed…As difficult as it may be, it’s a reality. It reminds me of what happened with my daughter a few years ago in regards to her hair. I knew then that I had to teach her to embrace her beauty inside and out- from her head, to her heart, to her toes! Much Love to you Shayzon! It’s important for people in authority to understand the effect they have on the people that answer to them and it’s important for them to want to be positive and have a positive impact. You find that some people don’t try to look or feel “great” because they’ve been torn down so much. They don’t know what it is to feel good about themselves. Thank you Shayzon for an awesome show. I didn’t know about this news, but it is so heartbreaking that we still have a lot of work to do. I’m so glad that there was a happy ending to this story and that those kids didn’t sit down and do nothing. Your show is such an inspiration to others. Thank you for sharing your story about what you went through. PHENOMENAL!!! Shayzon, I am not sure if you know how much of a GIFT you are to all who are bless with the opportunity to be impacted by you. Thank you for sharing in such a vulnerable way!!! You may never know how many people you have set FREE today…how many wounds you helped to heal…self esteem boosted and restored…confidence built and rebuilt!!! You are walking in your GIFT…you make the world proud…I am proud!! !